Another Utah-based hammock company, the Gear Hackers Evolution Insulated Hammock features premium 850+ FP down top and under quilts that have been permanently attached to a 1.6 oz 40D breathable ripstop nylon hammock. The top quilt features a center zipper and baffles at the neck to cut drafts. The hammock is a single-panel design with a lightweight 1.6 oz diamond ripstop nylon. The hammock comes complete with a bishop-style stuff sack, aluminum wiregate carabiners, and a mesh storage stuff sack. I’ve grown to respect and love insulated hammocks, even the only reason is selfish: I’m tired of being woken in the night to “fix” another’s under quilt. This happens regularly with my kids, who tend to shuffle in the night and are prone to popping off a quilt. I want my kids to sleep warm and comfortable and I’ve found that insulated hammocks make this work so well. And for my kids who sleep cold, the down insulation makes a huge difference in weight and bulk when we pack but also keeps them super warm. 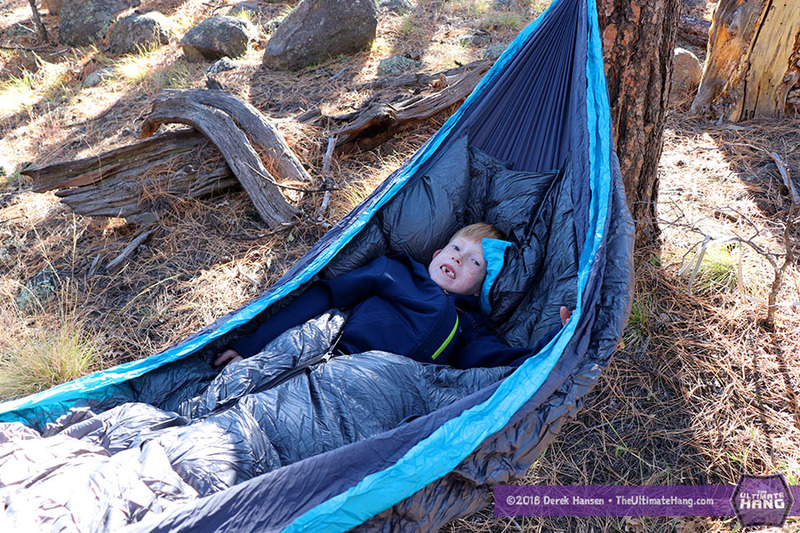 At my recent backpacking trip with the Scouts, my son insisted on bringing an insulated hammock because he’s had such success with it. It’s a no-brainer. The top zipper really works well when entering and exiting the hammock without allowing the quilt to flop and drag on the ground like other designs. Laying diagonally is easily done, but because the quilt is sewn into the hammock, I have to play with the zipper position and baffles to keep things out of my face. I think my only real challenge with the integrated top quilt is feeling “snug.” It’s partly personal preference, but there’s more room or space in the quilt to fill. I haven’t been cold yet, but I can always add another lightweight quilt inside if needed. Layering is always a good idea. The hammock is large and has a comfortable lay. Other insulated hammocks I’ve tested were on the small side, but this is a full size hammock (over 10 ft / 3 m long). The hammock doesn’t come with a suspension kit, so that’s an extra element you’ll have to purchase, but the end loops and carabiners are a great match. I like how the end loops are through the hammock channel and not tied to it. This allows the sides of the hammock to pull and “relax” a little, allowing for less tension when laying diagonally. Suspension and Anchor System ★ ★ ★ ☆ ☆ The hammock comes with end loops and carabiners but no strap system. Construction and Craftsmanship ★ ★ ★ ★ ☆ High quality construction and materials. Some loose threads and stitching is variable. Modularity ★★★★☆ The open hammock design is very modular, but for camping, it’s missing a bug net. For modularity, this is a plus, but if you’re looking for complete camping system, this will need another add-on. Price and Value ★★★★☆ Considering you’re getting three in one: hammock + top quilt + under quilt—all of which are premium quality and materials, it’s a pretty good deal. However, dropping $500 in one shot is a lot for many to swallow. Just received mine today. Sat in it for a few minutes today, very comfortable. It was 44 deg and windy. I was cozy. It may be a while before I can take it out for an overnighter. I have been looking for a good option, and this review introduced me to this company/hammock. I did communicate with Gear Hackers, and their prompt response to my questions also helped me with my decision.